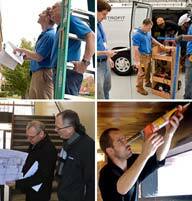 B|E Retrofit is a full service design and install weatherization contractor. Whether your project is a university, municipality, school district, hospital, public housing authority or a commercial site, we can handle the full scope of any weatherization project, large or small. Project Developers and Project Managers at ESCOs, Design-Build Engineers and Contractors call on B|E Retrofit for our expertise, our clear communications and our professionalism throughout every phase of the weatherization process. Our experienced on-site managers and trained in-house teams assure that all installation work is performed with the highest level of professionalism. When a problem is encountered, it is handled immediately with courtesy, integrity, and the knowledge that our work impacts your reputation. Learn more about our project managers. Our commitment to Project Developers includes expert building envelope audits, easy-to-use reports and quick turnaround times. We deliver all of the information required for you to quickly and confidently incorporate the weatherization scope of work into your project. Read more about our commitment and follow-through. When you hire B|E Retrofit, you can be confident that your weatherization design and installation needs are in the hands of an industry leader. We provide our ESCO, Design-Build Engineer, and Contractor-Partners with both design-build services as well installation-only support on an existing project designs. Learn more about working with an industry leader. Work with a company setting the standard of excellence in weatherization. Email us today at solutions@beretrofit.com. Or request sample project documentation reports here.